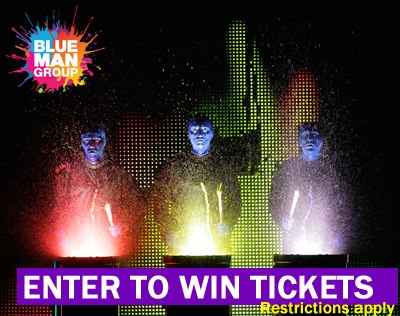 Win four tickets to see Blue Man Group! A few years ago, dh and a bunch of us went to see Blue Man Group in Boston. Much like the ads promised, we had a fantastic time: it was ninety minutes of interactive performance art that was a visual and aural overdose of amazing. 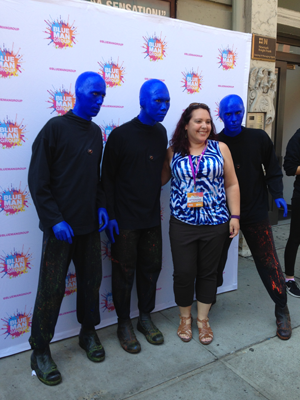 Fast forward to this summer, when Blogger Bash offered attendees the opportunity to see Blue Man Group on the first day of the conference. Naturally, I jumped at the chance. Only a couple of the bits I saw years ago were still there, specifically the “paint drumming” and grand finale (both of which have been featured in TV ads for years), but most of the show was stuff I’d never seen–and it was thought-provoking and relentlessly creative. Better still, after the show ended, we were told that the Blue Man Group folks were gifting each of us with a family four-pack of tickets to give away! What’s really incredible is that the winner doesn’t even have to go to New York City to take advantage of this offer. The tickets can be redeemed for shows at any Blue Man Group domestic location–Boston, New York, Orlando, Chicago, or Las Vegas–or any tour stop on their National Tour. Tickets fulfillment runs from September 8, 2015 – June 8, 2016, with some restrictions (basically ordering more than two weeks in advance and avoiding holiday blackout periods). If you’re new to the Blue Man Group, you may wonder: Is Blue Man Group appropriate for kids? I’d say generally yes–with only limited reservations. There’s a strong use of color and motion, and the Blue Men’s mute performance makes it easier for kids who can’t follow heavy exposition. However, kiddos (or adults) who react strongly to strobe lights might fall prey to sensory overload at times. And the show can be LOUD, but that’s where earplugs come in handy. (They even have earplugs available, if you need them.) The “Bring the Kids” page on the Blue Man Group website has some great info and tips if you’re thinking about bringing the younglings along. Also note that there are a couple of Blue Man Group “Autism Speaks” performances yet to run in 2015; these are specifically designed to be friendlier to autistic people of all ages. Entering the giveaway is easy and all the fine print is listed below. Best of luck! 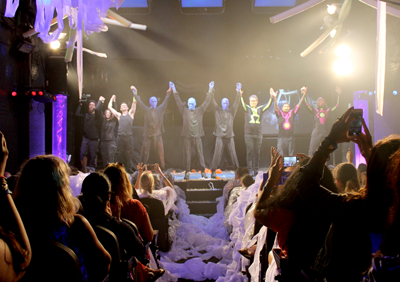 For more information about Blue Man Group, check out their website at http://blu.mn/bloggingblue. General rules: follow the rules and everybody gets along nicely. You earn entries based on your participation via the Rafflecopter widget, and this giveaway runs from 12:00am ET on Monday, August 10, 2015 until 12:00am ET on Monday, August 24, 2015. Only valid entries received during that timeframe will be considered legitimate. Anyone who commits fraud or tries to screw with the system, game the system, or otherwise not play nicely will be removed from consideration. Check “Wheaton’s 1st Law” if you want to understand where I’m coming from, folks. The winner will be notified by email within 1 week of selection. This blog is sponsoring this giveaway, which was kindly donated by the folks at Blue Man Group. I did not receive anything from Blue Man Group in exchange for hosting this giveaway; all bloggers who attended the Blue Man Group performance that was part of Blogger Bash 15 were offered the opportunity to host this giveaway. I only get the satisfaction of knowing someone else gets to have a good time at a show.